Lou Reed recorded the album Berlin in 1973. It was a commercial failure. Over the next 33 years, he never performed the album live. For five nights in December 2006 at St. Ann's Warehouse Brooklyn, Lou Reed performed his masterwork about love's dark sisters, jealousy, rage and loss. So opens the filmed version of the performance of Reed's third solo album about a drug-addicted couple, Caroline and Jim, and their tragic love story. When Schnabel first heard the album in 1973, he was so affected by it that he would play it on a daily basis. Later, when he would meet and befriend Lou Reed, he would plead with Reed to let him make it into a movie. And Reed had always intended for his rock opera to be performed on stage--but the mixed reviews and poor sales nixed that plan. Lou Reed's Berlin is the convergence of both their dreams: Lou Reed backed by a thirty piece band and twelve choristers is captured by Schnabel's portrait-like direction in a most unique concert performance. With similar techniques as used in The Diving Bell and the Butterfly, Schnabel uses light, superimposition, montage flashes and symbolic imagery to not only put us in the midst of the performance, but illuminate the story behind the songs as well. Schnabel even uses actress Emmanuelle Seigneur (aka "Mrs. Roman Polanski") who played Celine in The Diving Bell and the Butterfly to portray the tragic Caroline. Between the musicians on stage and the montage inserts, Schnabel and Reed create an effect that is both visually and aurally mesmerizing. My favorite moment was back-up singer Antony Hegarty's solo in the encore Candy Says. His beautifully emotive performance brought tears to Lou Reed's eyes. There's also a rendition of Sweet Jane at the end of the film. Lou Reed fans will no doubt be enthralled by this film. The DVD contains footage of the show on tour and an excerpt from Spectacle: Elvis Costello with Lou Reed and Julian Schnabel, which is notable mainly for the fact that Mr. Reed, at age 65 or so, looks much more fit than either Costello (53) or Schnabel (56). 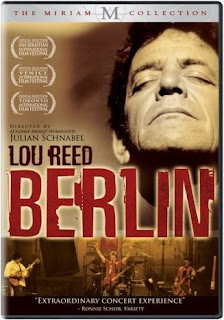 Lou Reed's Berlin available on DVD September 30th.